It takes about an hour to get from the campsite to the centre of town. While we found Vienna overwhelming and too colossal, Prague feels like a very vivid city. 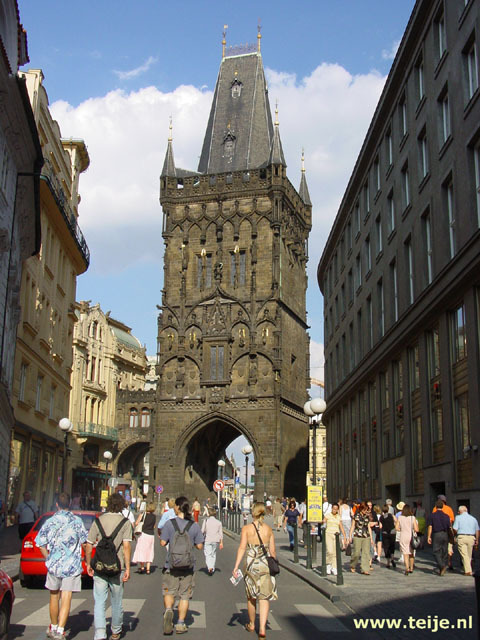 The old villages that now form Prague are made up of squares and monumental buildings like palaces and churches. Much of the medieval houses have been pulled down, but from the 18th century on a lot has been preserved. That is why here, like in Vienna, the baroque style dominates, although less bombastic. To get to know this city better you really need a travel guide. Immediately we have the sense that Prague is more pleasant than Vienna, on the one hand because it is less bombastic, on the other hand because the buildings and the people are more vividly. People seem to supplement the streets and to fit into them, while in Vienna people didn't seem to bother, since the buildings dominated all. We start our walk in the old town (Stare Mesto, on the eastern shore of the river) near the Powder Gate and slowly walk towards the town hall where we see a very beautiful astronomical clock from the 15th century. We just miss the striking of the whole hour, when the 12 apostles come out to make a round. One can climb the 70 meters high tower, but it is 30 degrees and we want to spare our legs, so we don't go up there. North of Stare Mesto lies Josefov, the former jewish ghetto. There are still many synagogues and all sorts of jewish shops. Very special is the jewish cemeterary, the oldest in the world. Already in the 10th century there was a jewish community and Prague has been one of the most tolerant cities towards jews in the last 10 centuries. From the shore of the Vltava River, we can see the castle of Prague with its cathedral on the western shore. We cross the river today, but we keep a visit to the castle for tomorrow. Off course, we use Charles Bridge to cross the river. It is very busy, not only with tourists, but also with street musicians and portraitists. The building of the bridge started in the 15th century, but the famous statues on the bridge (mainly saints) have been put there from the 17th century on. On the western shore starts the neighbourhood Mala Strana (small side) where many embassies are and they are well guarded, especially the American embassy. Cars are being stopped and searched with mirrors to see if there is anything under the bottom. Halfway up Rozhledna, a sort of small Eiffeltower, we give up and return to a bar in the shadow. It is too hot and we really need some refreshment. Prague is a very pleasant city to walk through, with all its alleys and squares. Often, we turn around a corner and find something surprising, a building or a statue. Despite all the breaks we take, we walk quite a few kilometers, more than we are used to. Another break, on a hidden terrace next to the river: a very narrow passageway leads to it and there is even a traffic light. From there we have a beautiful view on the river and the Charles Bridge. Well, we could tell much more about the city and our walk through it, but we have seen so many things that it would be a boring list of all interesting buildings; you have to see them for yourself, not just read about them. We really enjoy this city, that is for sure. At night we see the weather forecast: it will be much cooler next days (good for walking), but there can also be heavy rain and thunderstorms.